Dr. Jeff Gore is an associate professor in entomology at the Delta Research and Extension Center in Stoneville, Mississippi. We address real world problems growers face on an annual basis and new problems as they arise. We evaluate new products, technologies, and new techniques to improve management of insect pests. For instance, we are in our seventh year of testing the third generation of Bt cottons from several companies that are set for release in the near future. We try to stay out in front of any new products that come along before they hit the marketplace so that we can provide growers and consultants with information they need to use those products in the most economical and effective way possible. We also conduct a lot of graduate student training and many of their projects are fundamental in nature with a strong applied influence. The majority of their projects evaluate economic thresholds and various management strategies, like cultural control methods, which include planting date, fertilizer use, irrigation strategies, novel insecticide use strategies, and variety selection. We have developed a set of best management practices for combating tarnished plant bugs in cotton. We conducted research on various aspects of cotton production such as planting date, variety selection, nitrogen use rate, irrigation strategy, and insecticide application strategies to determine their impact on tarnished plant bug populations and injury to cotton. Our recommendation now is plant before May 7, select the short-season variety that is semi-hairy to hairy, reduce nitrogen rates by up to 20 percent and spray based on action thresholds published in the MSU Extension Service Insect Control Guide for Agronomic Crops. In our research on tarnished plant bugs, we discovered the pests prefer varieties with smooth leaves and tend to hit crops the hardest toward the end of the season. By selecting a short-season variety with hairy leaves, we were able to reduce yield loss caused by tarnished plant bugs by up to 50 percent while reducing the number of sprays needed to produce the crop. We want to benefit the people of Mississippi and the way we do that is by making growers more profitable and making the production systems more sustainable and environmentally-friendly. Colleagues and I formed the Mid-South Entomology Working Group, an informal working group among entomologists in Mississippi, Louisiana, Arkansas, western Tennessee, and southeastern Missouri. We meet several times throughout the year to discuss insect-related problems, current research, and changes in recommendations for the region. Numerous collaborative research projects have come out of that relationship. For instance, we evaluated tarnished plant bug sampling methods and thresholds across the entire Mid-South. Prior to that research, each state had a different action threshold for when to spray tarnished plant bugs. As a result of that collaborative effort, our action thresholds are now consistent across all states. By having a unified voice, our growers and consultants have more confidence in our recommendations. We pool our resources to better address our clientele’s needs. How Does Your Research Help Inform Your Extension Role And Vice Versa? Our team, which consists of Angus Catchot, Fred Musser, Don Cook, and me, is a shining example of how extension, research, and academe work together toward the common goal of serving the people of Mississippi. It’s difficult for me to separate research and extension because they are so interconnected and that’s the way it should be. From an extension standpoint, my conversations with other extension specialists, consultants, retailers, and growers let me know what problems producers are facing in the field, out in the real world. That gives me the information I need to know where to direct my research. 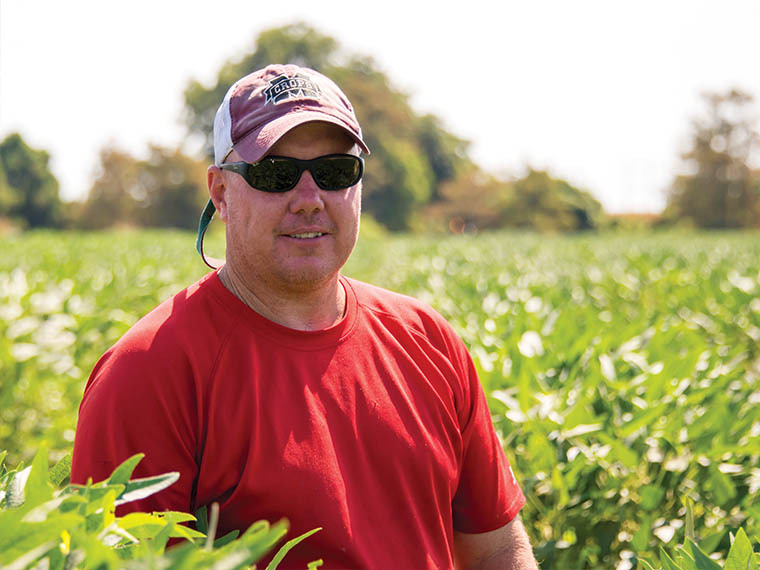 As a team, we strive to help growers fine-tune their strategy. We want to benefit the people of Mississippi and the way we do that is by making growers more profitable and making the production systems more sustainable and environmentally-friendly. What Research Are You Looking Forward To On The Horizon? The sugarcane aphid in grain sorghum is a huge opportunity for research because it is so new to our state. Recently, grain sorghum acres in Mississippi have grown from 65,000 acres in 2013 to 105,000 in 2014, a 40 percent increase. Meanwhile, the sugarcane aphid, a common pest of sugarcane, found a new host in grain sorghum. This began in Louisiana and south Texas in 2012 and growers and scientists were scrambling to save the sorghum. In Mississippi, we saw what was happening and did our best to be preemptive. We had the efficacy data required to file a Section 18 emergency exemption to apply Dow’s Transform® insecticide to sorghum. Another insecticide, Bayer Crop Science’s Sivanto® is a newly registered product used primarily on vegetables. While sorghum was listed on the label, the minimum rates on the label priced our sorghum growers out of the market. We tested lower rates and provided the science that allowed the company to add a reduced rate addendum for specific use in sorghum. I also look forward to the possibility of genetically-engineered cotton resistant to tarnished plant bugs and thrips on the horizon. That’s what could potentially bring cotton back to the Delta.